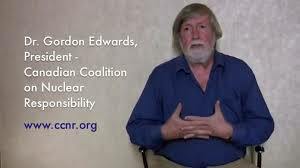 A conversation with Dr. Gordon Edwards: contemporary issues in the Canadian nuclear industry, and a look back at the achievements of the Canadian Coalition for Nuclear Responsibility (CCNR), http://www.ccnr.org/ Montreal, August 25, 2018, Nuclear waste management: an exercise in cynical thinking. DiaNuke.org, 24 Sept 2018. The elusive “willing host community”DR: I know too there have been a lot of targeted “willing host communities” that have rejected it. Do you think they’ll succeed in finding one? GE: Here in Canada they have gone through this process of looking for a “willing host community,” which is kind of foolish because these communities are very small. For example, I just visited two of them within the last few weeks way up above Lake Superior. In the two communities that I visited, Hornepayne and Manitouwadge, I gave presentations. These communities have less than a thousand residents in each one of them and they get $300,000 a year as basically bribe money in order to keep them on the hook, to keep them interested in learning more. It’s called the “learn more” program, and as long as they’re “learning more,” they can get $300,000 a year. Well, they are both interested in getting the money, and consequently they’re still in the running, but do they really want to be a nuclear-waste community? If this is such a good deal for them, then why aren’t other communities bidding for this—larger communities? Of course, one of the points that comes to mind immediately is that if you had a city of a million people or so, then you’d have to shell out $300 million instead of $300,000 every year, so this idea of a “willing host community” exists only because of the bribes that are given by the industry in order to keep these communities supposedly interested in receiving the waste. And in some of them, of course, there are people who see dollar signs and who see an opportunity for them to make a lot of money. In a small community, a certain small number of people can make a lot of money by capitalizing on an opportunity like that without being concerned very much about the long-term wisdom of it. DR: Yeah, and the seventh future generation doesn’t get a voice. I did speak to two other communities a couple of years ago in that same general area north of Lake Superior. One of them was the town of Schreiber, and one of them was White River, and both of those communities are now off the list. They’re no longer candidates, so we now have only three communities up north of Lake Superior which are still actively pursuing this program of taking money and “learning more.” I have spoken now to two of them and I haven’t yet been invited to go to the third one. 10. The great unknowable: long term care for nuclear waste. Who pays? Who cares?When I go there I try and point out to them not only the fact that this whole exercise is questionable, but also the fact that once the nuclear waste is moved up to a small remote area like this, what guarantee is there that it’s really going to be looked after properly? Because these small communities do not have a powerful voice. They don’t have economic clout, and so they can’t really control this. If a person like Donald Trump, for example in the United States, or Doug Ford in Ontario, who many people think is a kind of a mini Donald Trump, thinks, “Why are we going to spend money on that? Forget it we’re not going to spend money on that,” then it’s going to not be pursued as originally planned. And it could become just a surface parking lot for high-level nuclear waste. Who is going to guarantee that it is actually going to be carried out? Now the nuclear plants are in danger of closing down. We’re having fewer nuclear plants every year than we had the year before now in North America, and consequently there’s not the revenue generation that there used to be. The money that’s been set aside is nowhere near adequate to carry out the grandiose project they’re talking about, which here in Canada is estimated to cost at least twenty-two billion dollars. They have maybe five or six billion, but that’s not nearly enough. So there’s also another problem lurking in the wings, and that is that if you do want to carry out this actual full-scale program of geological excavation with all the care that was originally planned, how do you generate revenue? What company is willing to spend twenty-two billion dollars on a project which generates absolutely no revenue? There are only two ways you can generate revenue from that, and one way is to take waste of other countries and charge a fee for storing the waste. The other thing is to sell the plutonium. If you extract the plutonium, then you could have a marketable product, but both of these ideas are extremely far from what these communities are being told. In other words, the plan that’s being presented to them does not include either one of these possibilities, and it changes the game considerably. As we all know, getting the plutonium out of the spent fuel involves huge volumes of liquid radioactive waste. It involves very great emissions, atmospheric emissions, and liquid emissions. The most radioactively polluted sites on the face of the earth are the places where they’ve done extensive reprocessing, such as Hanford in Washington, Sellafield in northern England, La Hague in France, Mayak in Russia, and so on. DR: And Rokkasho in Japan. GE: That’s right, and so this is a completely different picture than what they’re being presented with. Now whether or not that would actually happen is anybody’s guess, but it’s written right in their documents that this is an option, and they’ve never excluded that option. They’ve always included the option. In fact, the first sentence of the environmental impact statement written by Atomic Energy of Canada Limited many years ago says that when we say high-level nuclear waste we mean either irradiated nuclear fuel or solidified post-reprocessing waste. They have always kept that door open for reprocessing.